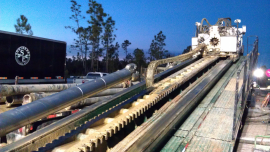 Utilizing a guided boring machine for sleeve port pipe installation, Constellation Group LLC provided technical and field support to install nearly 80,000 gallons of sodium silicate grout for a tunneling operation under active railroad tracks. With four sets of dual component pumps operating, an average of 3000 gallons of grout were pumped daily. The equipment was designed by CGLLC and built by the contractor. This project is discussed at length in this paper: Support of Tunneling with Chemical Grouting in New Jersey; presented at NASTT 2012. Using HDD drilled and installed sleeve port pipes (TAMs), CGLLC working for Aaron Enterprises (AE), York, PA pumped over 25,000 gallons of sodium silicate grout to provide ground stabilization and water control under the Pennsylvania Turnpike. AE then installed a 10 foot by 12 foot box culvert 10 feet underground to provide diverted stream water around new construction. A grout plant utilizing 4 duplex pumps was designed by CGLLC for this project. This project was the second of its kind in the USA to utilize HDD (horizontally directional drilled) sleeve port pipes. Working with Aaron Enterprises, this project demonstrated the feasibility of support of tunneling without interfering with the railroad tracks overhead. CGLLC has worked with numerous contractors to control groundwater during shaft excavation. By using sodium silicate or acrylamide grouts, substantial water influx was substantially reduced. Spillway Stabilization- Dennis, New Jersey– Using two different rapid setting urethane grouts and sleeve port pipes, erosion under a small environmentally sensitive dam spillway was minimized. Grouts were supplied by Avanti. CGLLC has long-term experience in ground stabilization to control water infiltration and flow. Work includes quarries and mines, including positive hydrostatic pressure situations. Some notable projects include Millville Quarry, WV; Texas Quarry, Maryland and Rittenhouse Square, Philadelphia. Guy has been involved with new construction grouting and repair of post-tensioned structures since 2000. Some of the work was repairing old damage, other repairs were for correcting grouting problems encountered during new construction. Guy Dickes, president of CGLLC, implemented the use of high capacity HVAC vacuum pumps, significantly improving field operations. All major post-tenioning and grouting contractors now use this type of pump. Guy Dickes is a former professional member of the American Segmental Bridge Institute and graduated in the first certified grouting class. A technical paper was presented and published at the October 2008 PCI/FHWA National Bridge Conference. See Papers and Articles Page.